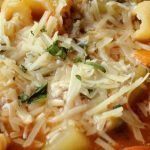 Wonderfully healthy vegetables with beans and pasta is the basis for this classical minestrone soup. What a dish for that chilly autumn evening after a day on the lake.Note: You can change the number of people served by placing your cursor over "Servings". The Ingredients will adjust to the new number of servings. 1 cup dried white beans such as cannellini or great northern. Place the beans in a large bowl and fill with water to cover by 1 inch. Cover and soak for 8 hours or overnight. Drain beans and place in a large pot. Add cold water to cover by 1 inch. Bring to a simmer over medium heat, cover and adjust heat to maintain a gentle simmer. Cook until beans are just tender, about 45 minutes to 1 hour. Set aside to cool. While the beans are cooking, fill a large pot or Dutch oven with water to cook the pasta and bring to a boil. Add the 1 cup of shell pasta, bring back to a boil then turn heat down to a simmer and cook for about 9 minutes or until the pasta is al dente. Drain and set aside. In the same large pot, heat 2 tablespoons oil over medium heat, add onion and cook, stirring until soft, 4 to 5 minutes. Add garlic, sage and rosemary. Cook, stirring, until fragrant about 1 minute more. Add tomatoes, broth and water, bring to a simmer, cover and adjust heat to maintain a gentle simmer. Cook for 1 to 1 1/2 hours. Add cabbage, carrots, green beans and reserved beans with their liquid. Cover and simmer gently until vegetables are tender, 25 to 30 minutes. Add reserved pasta and cook for another 5 minutes, till pasta is heated through. Stir in parsley and season with salt and pepper. Serve garnished with the Parmesan cheese. The soup will keep for 3 days in the refrigerator or for 1 month in the freezer.